The curved bars of this Kudox electric towel rail will add an extra dash of luxury to any bathroom interior. Its 250w output is able to heat areas up to 3m² for effective towel warming and supplementary heating. View Kudox 250w Chrome Curved Towel Rail datasheet here. Controllers and heaters for bathrooms, cloakrooms and wet rooms must be professionally installed by a qualified electrician and are not sold as a DIY product. Always defer to the manufacturer’s guidelines about the bathroom suitability of any product. The Curved Chrome Kudox 250w towel rail combines elegant design and practical storage, offering affordable luxury heating for your bathroom. This towel rail uses an energy-efficient thermal fluid element to make your bathroom and towels toasty in no time at all. The thermodynamic liquid inside the Kudox 250w has superb heat retention, so it can easily maintain its temperature without using a lot of energy. This model of the Kudox 250w comes with a chrome plate finish and has a beautiful curved-bar design that allows it to accommodate bulkier towels. 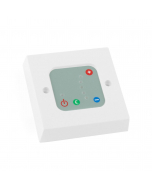 For extra safety, this product is thermo-fused and comes with a high IP55 ingress protection rating making it suitable for installation in zones 1 and 2 of your bathroom. Once attached to the wall-brackets, the fitted depth of this rail comes to a maximum of 104mm.